People routinely assume that start-ups with big marketing presence at trade shows, magazines, events, etc. are successful. This is highly misleading and obscures a critical factor in true long term success - the ratio of revenue to company investment. 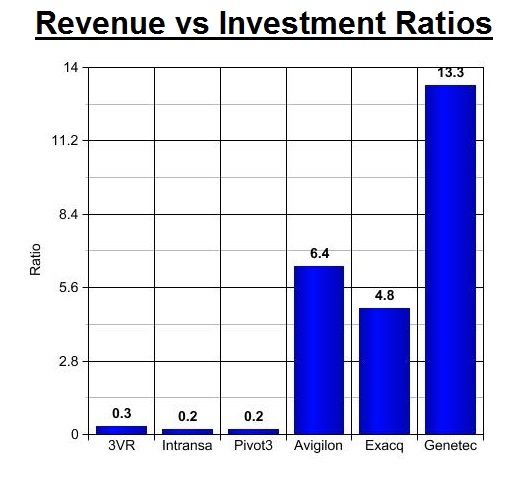 In this note we explain why companies with a low ratio, such as 3VR, Intransa and Pivot3 are in far worse shape and riskier than companies like Avigilon, Exacq and Genetec. Indeed, if you only looked at booth size, sales calls, ads, etc. (which is the easiest approach) you would think that the companies were of equal strength or that the former were actually stronger. This is far from the case. Buy business: If you spend a lot of money on sales people and marketing, you will get sales even if what you are selling has questionable value. A combination of vendor hype and end user naivety will assure that. Generate value: Even if you do not spend much on marketing, if you have a clear value proposition, you too will get sales. Here's where it gets confusing: In the short term both approaches can drive similar levels of revenue. As such, if you look at revenue alone, the companies appear to be similarly successful. That is highly highly misleading. Startup marketing spending splashes are inherently unsustainable. You cannot indefinitely sell dollar bills for 85 cents. This is a 'jump start' technique approved by investors to quickly get the startup to some level of critical mass. However, it can implode unless the company's products offer real sustainable value. These companies are roughly in the same revenue range and roughly founded in the same time frame (7-10 years ago). If you are looking at just revenue, the companies seem to be close. This difference in efficiency between the groups is drastic. It points to one clear fact - the latter group of companies are doing a much better job of meeting customer's needs and has a far greater likelihood of being successful. To cap it off, it is nearly certain that the companies in the latter group are all profitable while the companies in the former group are burning cash and are dependent on further investment. What About their Growth Rates? You might object and say, "3VR, Intransa, Pivot3, etc. keep on announcing record growth levels. Surely that shows their strength." However, the reality is that when you are spending so much on sales and marketing that such 'record' growth is needed just to survive. What About Independent Integrator Satisfaction? On the various online surveillance forums, Avigilon, Exacq and Genetec are three of the most commonly praised products by integrator technical people. Integrators love Avigilon so much that it is sometimes annoying. By contrast, we rarely, if ever, hear integrators recommending 3VR, Intransa or Pivot3. Indeed, our recent Intransa discussions confirm that most technical people remain skeptical about their value. While independent integrator satisfaction is much harder to read, it is clearly a much more reliable indicator of real product acceptance. This pattern happens regularly in the industry. Right now, the two recent entrants spending a ton on marketing are Briefcam and Brickcom. We hear about them all the time from their PR and sales people but rarely from integrators. Bad sign. If you want to reliably determine which companies are going to be sustainable leaders focus on the ratio of revenue to investment and what real integrators are saying, not the marketing machine.